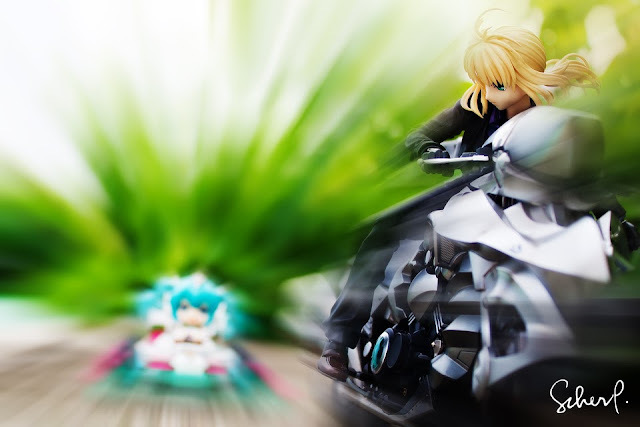 It's an epic race between Miku and Saber! Who do you think will win? Miku drives an Astute Special while Saber is on her flashy Yamaha V-Max! 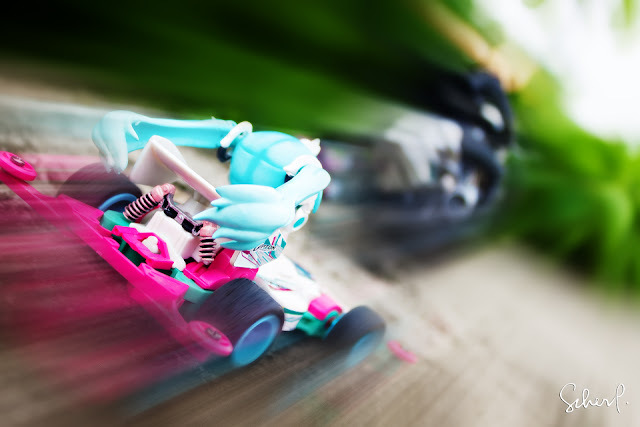 I used the zoom effects I did on my previous tutorial featuring my diecast cars. It worked really well for this set because these two are just on a roll to reach the finish line! The shoot was done in our rooftop. 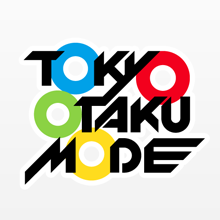 Kawaii! 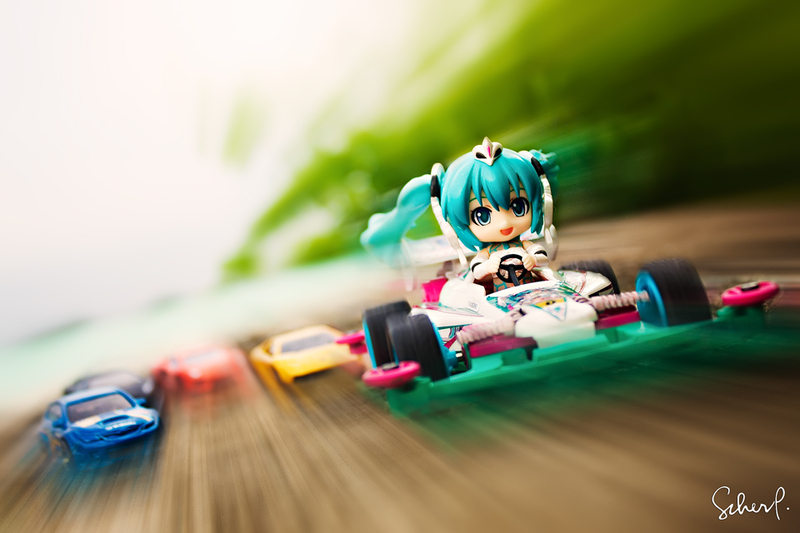 Racing Miku is being chased by supercars! 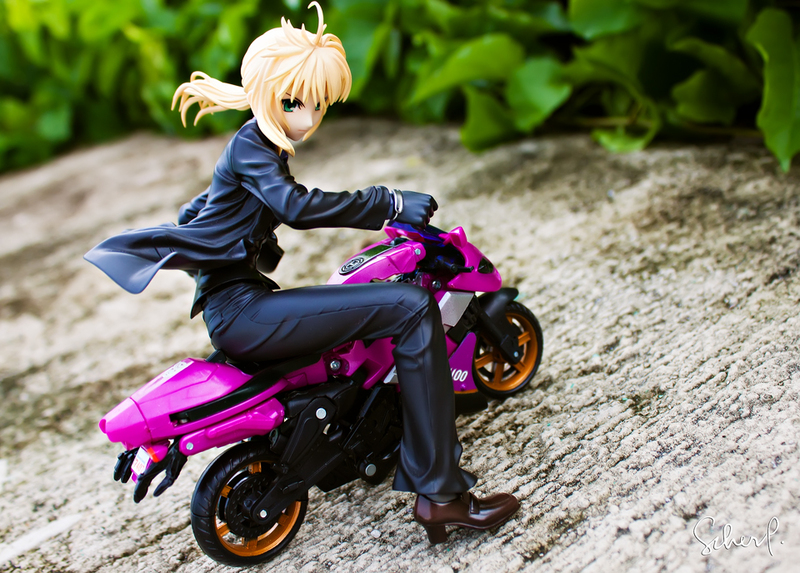 Meanwhile, check out Saber's new ride! It's pink! My favorite color hahaha! Hello again! 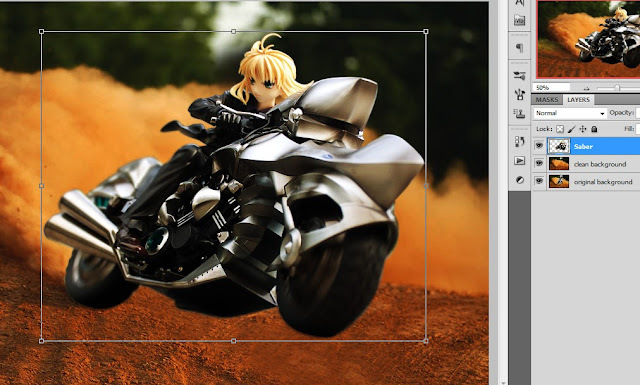 I feel like sharing a new tutorial today and it's about my latest work, Saber Motocross, which you've probably seen everywhere already ^_^ and this is just a simple tutorial on how the effect was made. 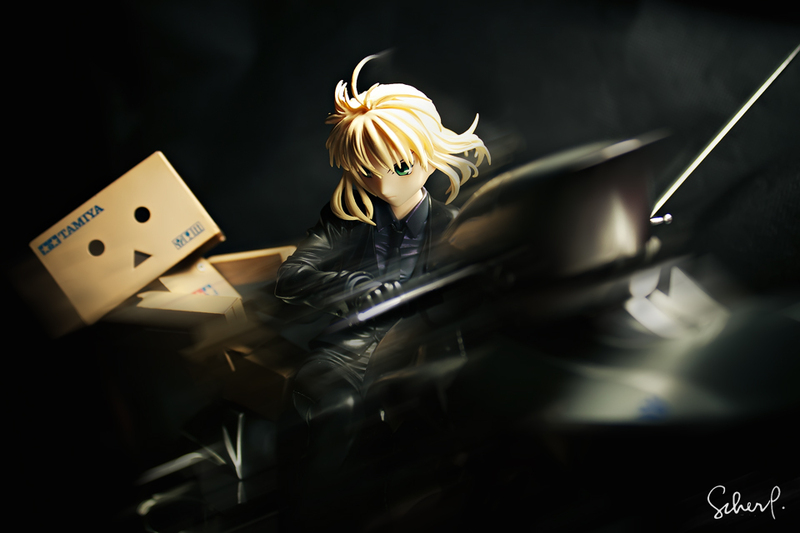 I thought of giving Saber a different look after doing a lot of photoshoots for her lately, I wanted something different so I made this new concept. 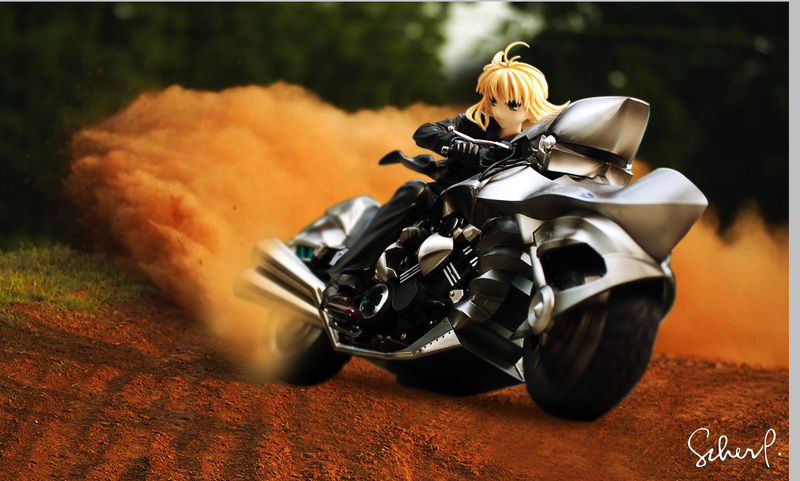 I got inspiration from at a motocross event, those daredevils with speed and technique in handling a bike; and since Saber is on a flashy Yamaha V-Max (though not motocross built XD) I thought it looks fine if I tune the outcome for a bit. Okay moving with the tutorial. 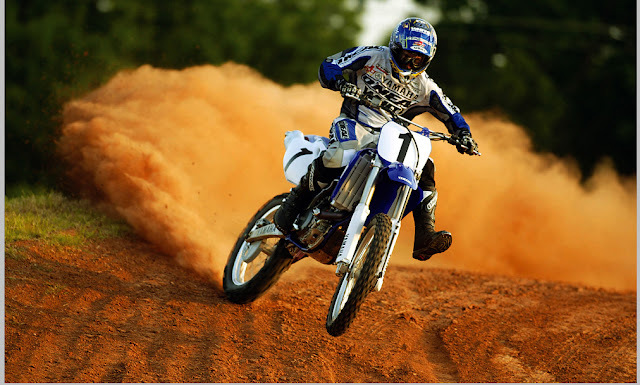 Let's start with an image I found online: A simple picture of a daredevil on a bike. 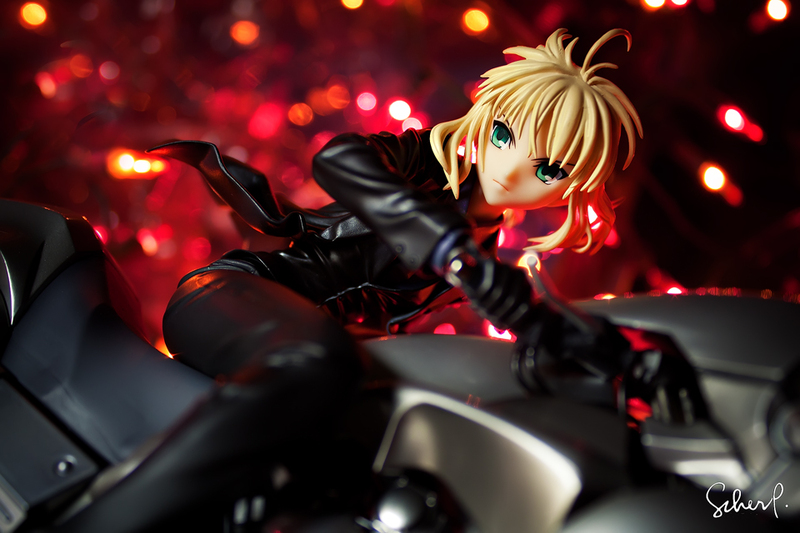 The smoke behind him is perfect for the Saber image that I choose. 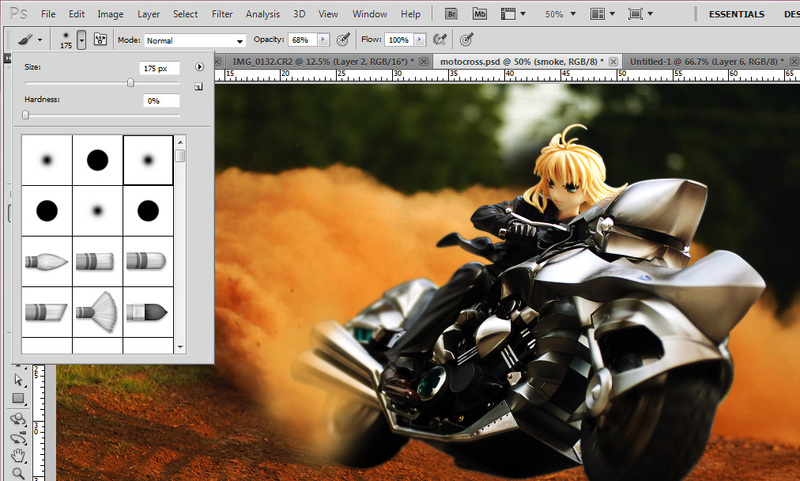 I prepared Saber first by making a copy so I will just impose it on this background. 1. 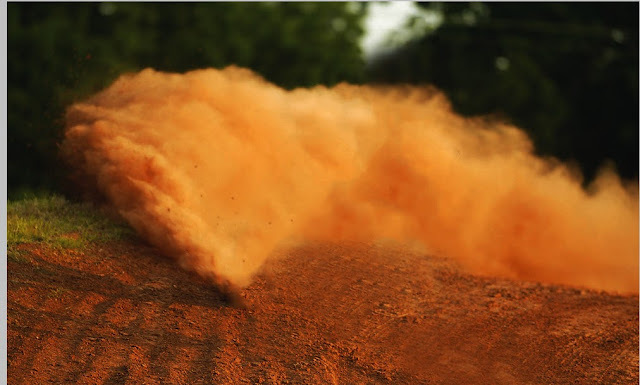 Prepare the 1st layer, the motocross picture. Duplicate it because we're gonna remove the person and just use the background instead. 2. Use the Lasso tool (L) and draw a line around the guy to select it. 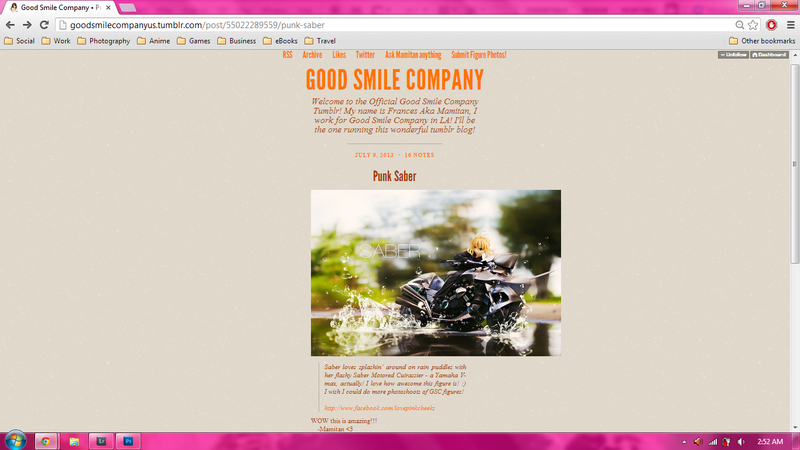 Then right-click > select FILL > CONTENT AWARE. This is a technique in Photoshop that removes something in a picture. I use it a lot for photobombers LOL. 4. 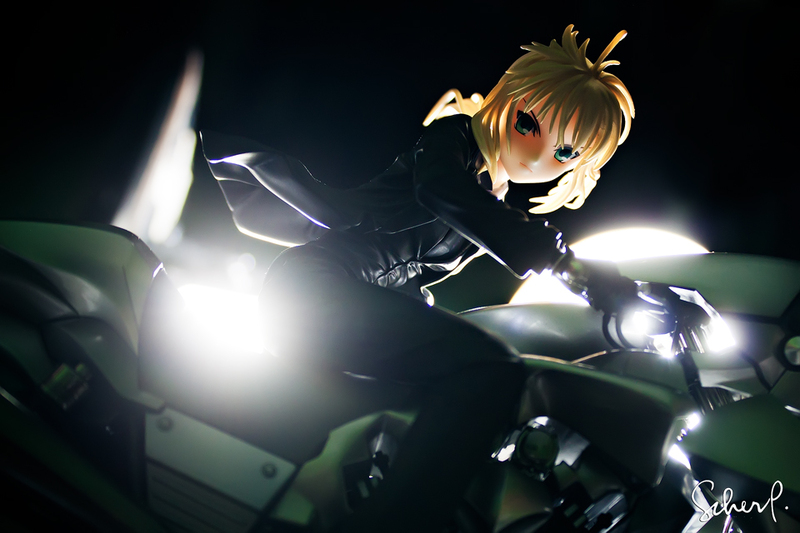 I dragged Saber to the background that I just prepared and positioned her just right the rear of her bike touches the end of the smoke. It makes her look like she's drifting, right? :D Notice the order of my layers at the right side. 5. Next, I made a made a new layer for the minimal smoke effect on her tires. I don't want to look like she's floating on sand so here I selected Soft Round Brush (174) in 68% opacity and made minimal touches at the rear. I made sure it's not too obvious to create a more realistic effect. 6. Almost done! 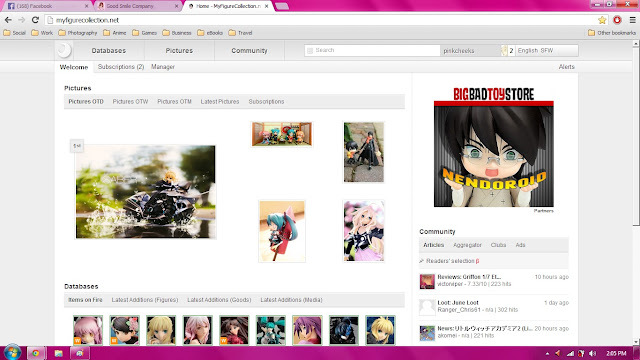 I just placed my watermark at the bottom right and merged all layers afterwards. Then I made global adjustments to the image like the brightness, contrast, vibrance, curves etc. for visual appeal. 7. There you have it! 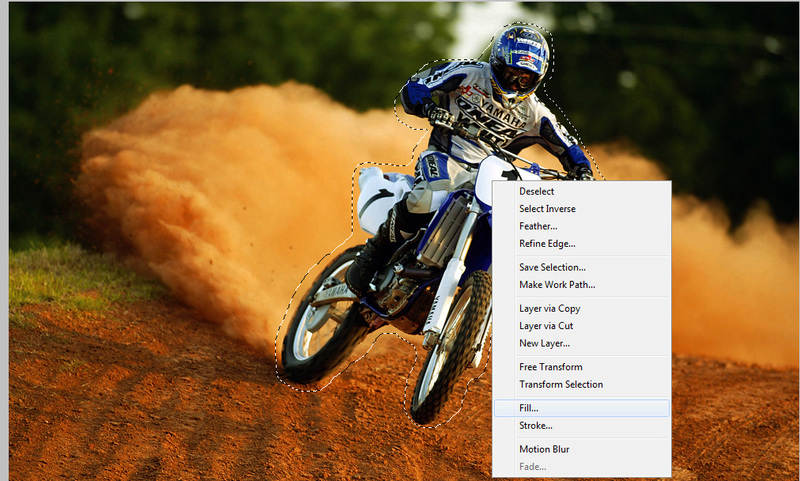 My very simple tutorial on how Saber Motocross was done! 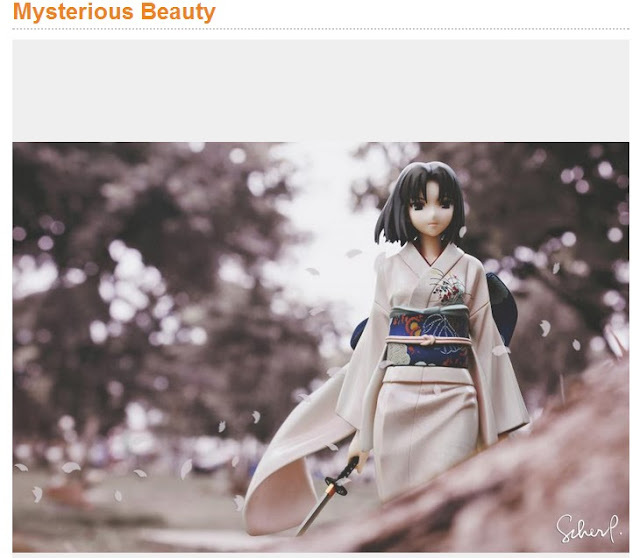 Please visit my fanpage for more pictures of Saber, you know how I like to share my love for toy photography all over the world. :D If you have questios, just ask! You may shoot me an email at ilovepinkcheeks at gmail dot com, make a comment here on my blog or visit my Formspring account. 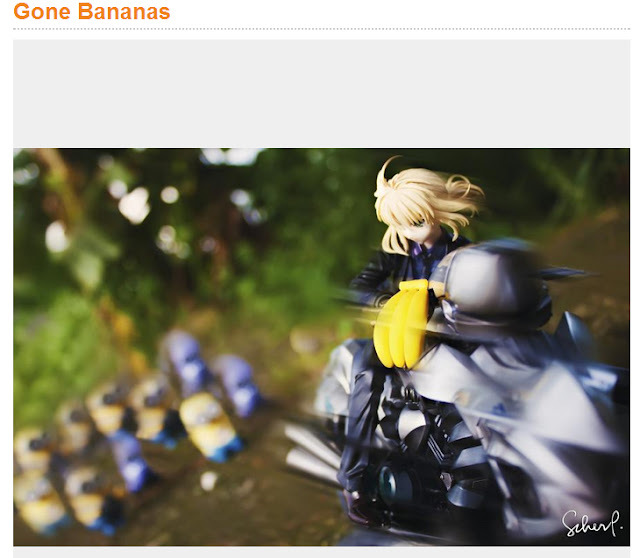 It's voting time at GSC's Summer Photo Contest! Oh wow! 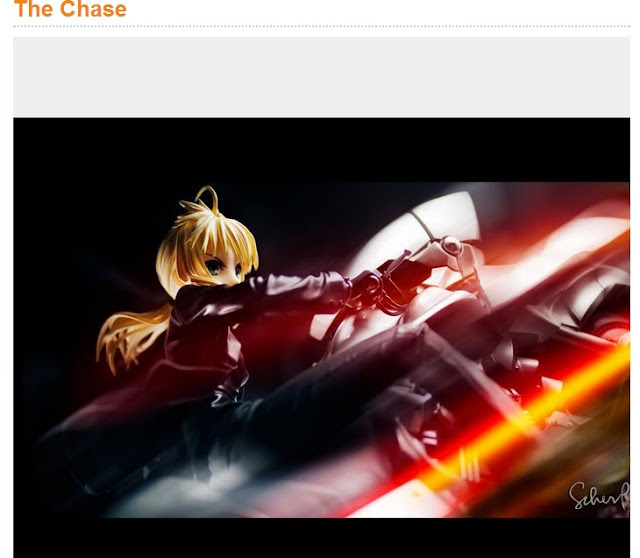 Thank you all for making my Punk Saber as today's Picture of the Day at MFC! I'm so happy! Yayyy! 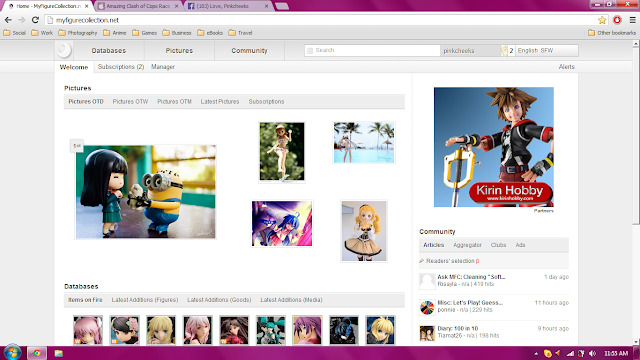 Mamitan also featured my photo on the GSC Tumblr site! 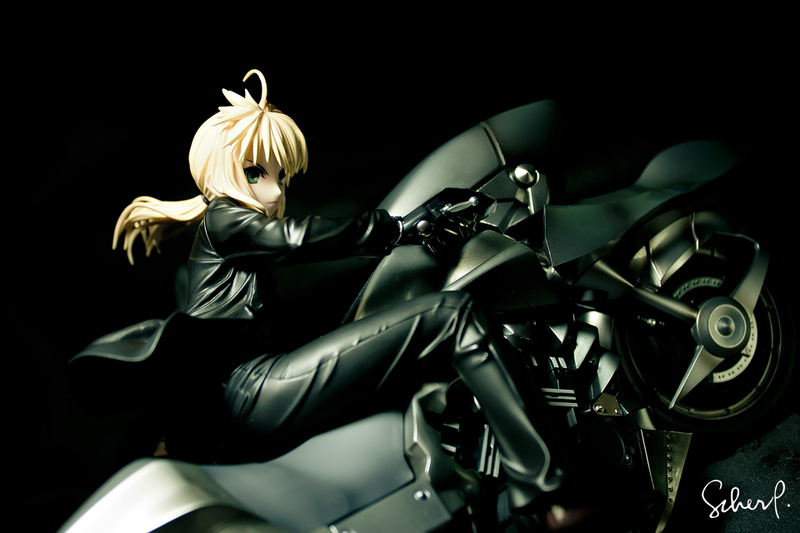 Ohh yeah, I did a badass photoshoot of Saber! 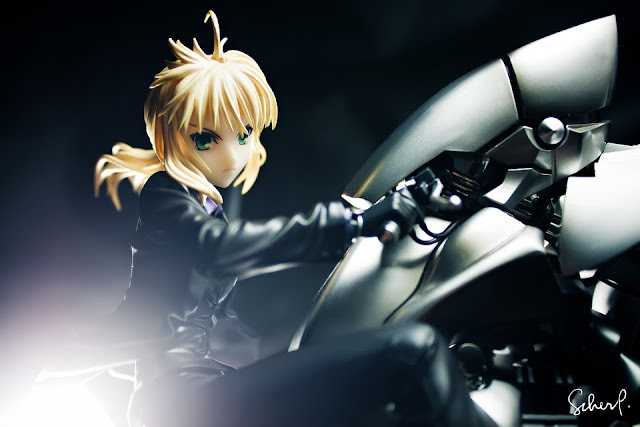 This is Saber x Saber Motored Cuirassier, a 1/8 Scale figure by Good Smile Company and she's a part of the Borrowed Happiness series. 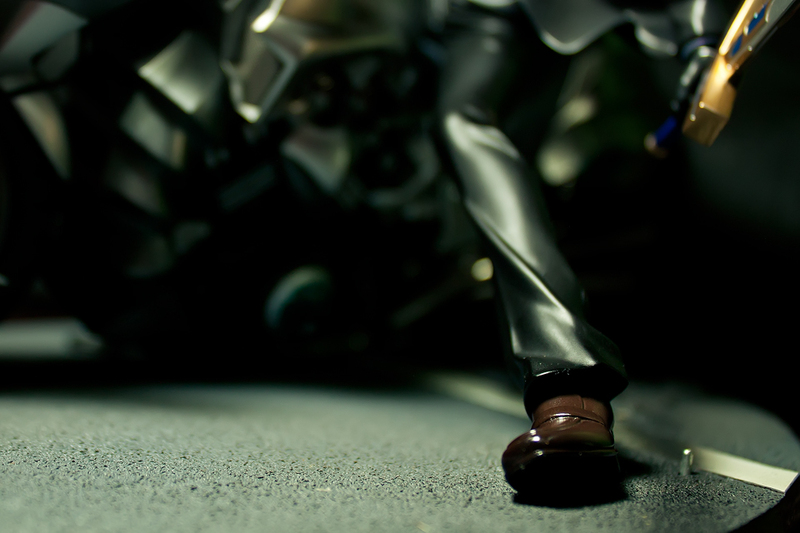 :) Here's the set of Saber's photoshoot and for this, I wanted her to look like a mobster on a chase so shooting her with one/two light setup is so appropriate for the set up. Whoops! 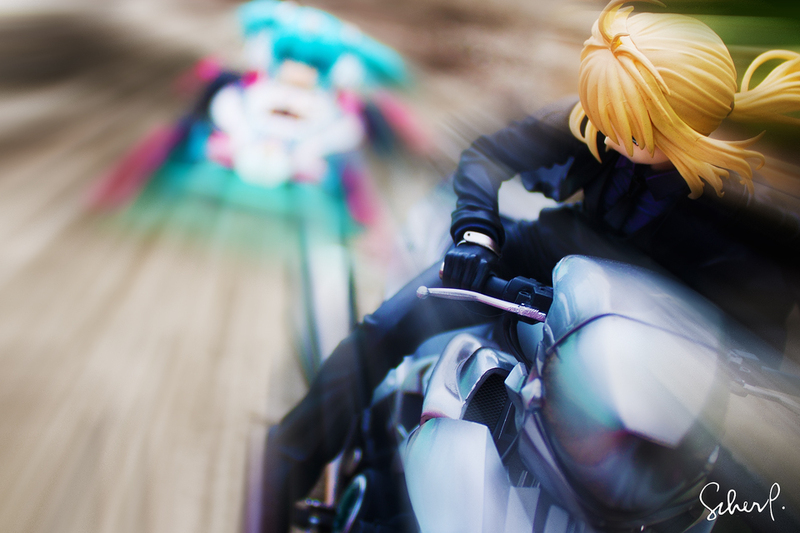 Danbo couldn't keep up with Saber's speed so he fell! 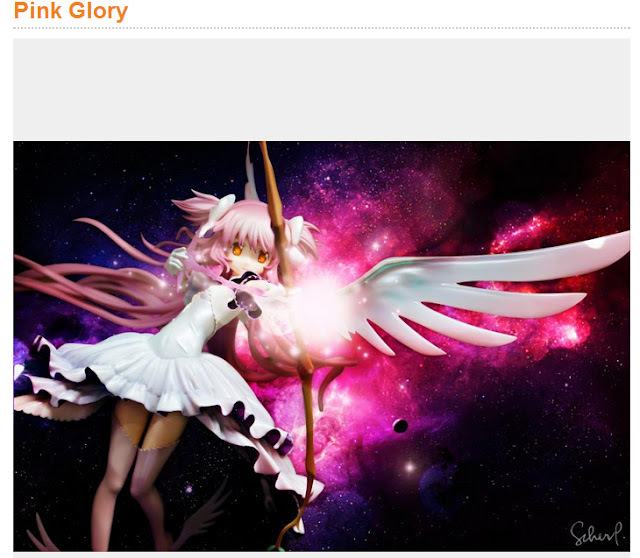 Okay so I'm just gonna do a mini review at how awesome this figure is. I'm so thankful that I had a chance to take a photoshoot of her awesomeness. 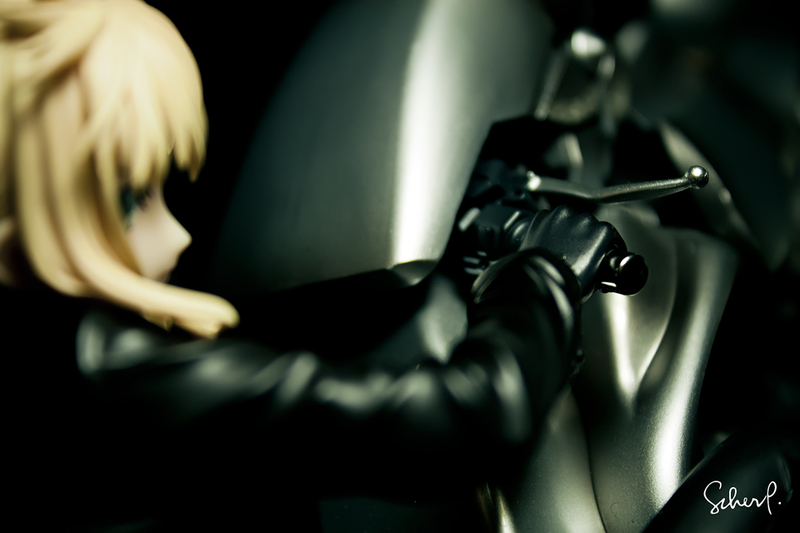 I'd say Saber has only a few good angles, but her badass Yamaha V-max doesn't. 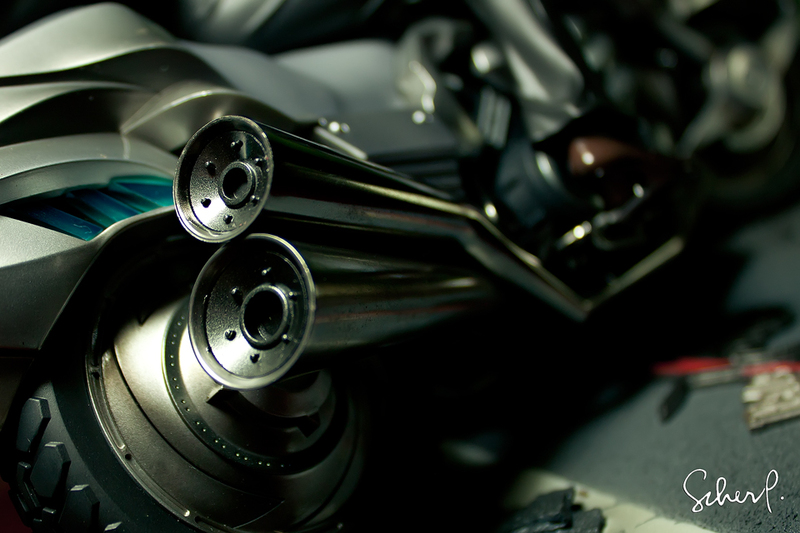 I enjoyed taking photos of her epic motorbike in all angles coz it's so detailed, the parts are so shiny and the paintjob is so flawless! 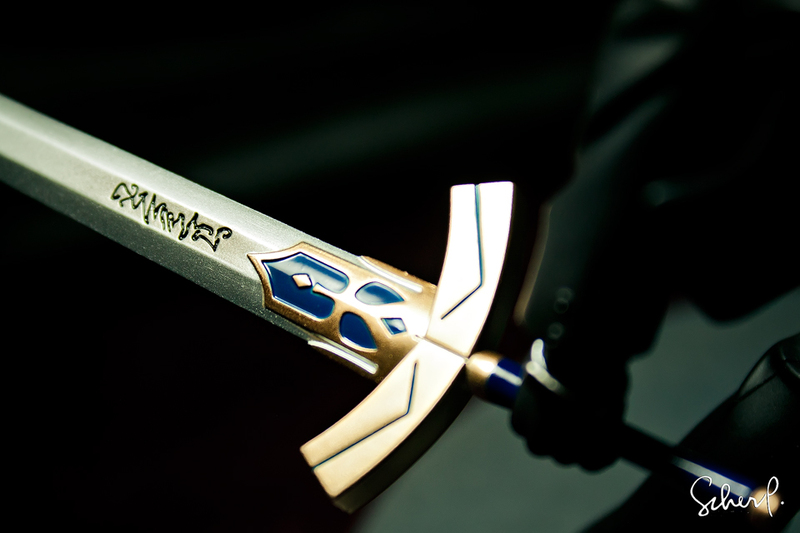 Saber's Excalibur Avalon Sword is also included. The intricate wording is so detailed and I like how the gold finish of the base is in contrast with the blue details of the sword. 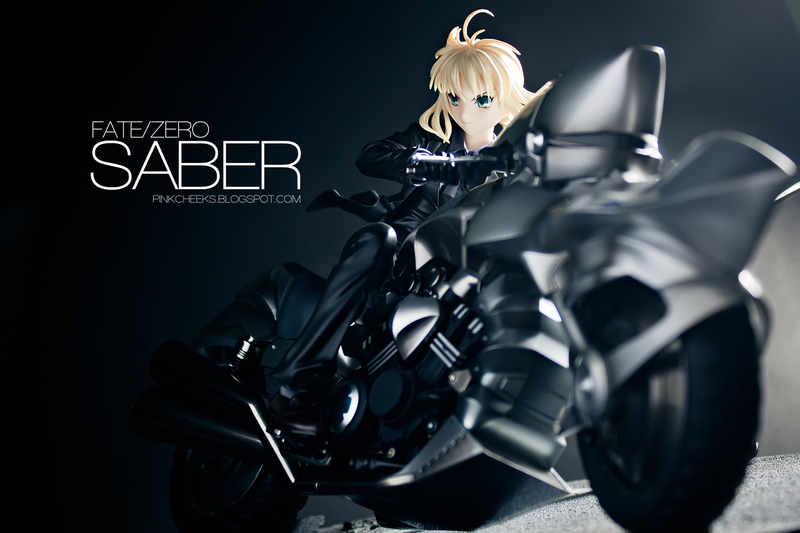 To balance Saber, you need to fit her heel on that small peg at the base. Waking up to a sweet Saturday morning to see this! Yay! Ooohhh... Look who I've got on my mini studio! It's Saber and her Saber Motored Cuirassier!